That 18 inning outing on Thursday night caught up with the Angels this weekend at The Stadium, as the Yanks came from behind twice to take the series. K-Rod had nothing on Saturday afternoon as the Yanks used walks and timely hitting to beat him, and on Sunday it was the usually reliable defense of the Angels coupled with poor pitching that allowed Tony Womack to win it in the 11th. This was an important set for the Yankees as the Red Sox were beating up on those Twinkies. The Sox have a set against the Royals next whilst the Yankees fly out to Cleveland to face the good pitching team that the Indians are. The Yankees are just trying to hang on to the Sox as they hope to get some pitchers back at some point in the near future. Tuesday's starter has yet to be announced although it will be in most likelihood either Al Leiter or Aaron Small. The hitting is still looking solid with the re-emergence of Jason Giambi as a major threat again being a huge plus point for the club. Nothing was doing for the trade deadline with only a minor deal seeing Buddy Groom swap New York for the desert in Arizona for a PTBNL or cash. So unless we make any deals on the waiver wire this month, these are the players we'll need to step up and play great baseball to make the post season. Well the Jon Papelbon era has started, and thankfully our hitters have taken him off the hook in a game that he didn't deserve to lose. The 2 earned runs that he gave up were solo shots to straight away / right center field, but more concerning (superficially) were the walks. I think today he gets a pass (!) on those - the majority of them coming in his last inning or so, when he did appear to be a bit gassed - not that surprising for a guy working his home major league debut. His first two innings saw him record a swinging K, swinging K, fly-out to left, single, hbp, pop up, swinging K, swinging K - nice work out of the gate, and enough to offer a lot of hope when he does make his stay in the majors permanent. One question though (in multiple parts) - Papelbon did look done after 5 - why send him back out there? And once you did, why bring in Delcarmen to make his home debut in a situation where he was unlikely to succeed - 2 on, 1 out in the 6th? We have had two multiple run leads over the last couple of days, would it not have made more sense to bring him in one of those games? In his post game comments about Manny, Terry Francona revealed that Jon Papelbon will start tomorrow afternoon's game against the Twins. Papelbon is held up as an example of the growing strength of the Sox's minor league system - at the time of his appointment Theo declared that he wanted to turn the Sox from an organization that was exclusively dependent on FA signings, into a player development machine that used FA signings to compliment the team - so appearances such as this are important as we review Theo's progress. Papelbon was drafted by the Oakland Athletics in the 40th round of the 2002 draft by the Oakland A's, but spent a year at Mississippi State (compiling a 6-2, 2.28 ERA in 25 appearances, as well as racking up 7 saves) before being drafted by the Sox in the 4th round (114th overall) in the 2003 draft. So from Sox draft to first appearance in the majors has taken roughly 2 years - a reasonably fast rate of promotion. One of the things that amazes me about baseball is the number of fans who claim to have definitive views on minor league players - I can name a number of the Sox more highly regarded prospects, and can tell you what other people think of them, but I really can't tell any more than that. So as Jon Papelbon gets ready for his first start - and the reason for the part 1 in the title is that I can't believe this is anymore than the shortest of stops in Boston - what do people think of him? The excellent John Sickels carried this review of the Sox system back in March, which was updated in May - the general theme, Papelbon is a reasonable prospect who is having a nice year. Baseball Prospectus gives this perspective - be sure to check out the names in the 'comparable pitchers' area! Sox Prospects.com includes a nice scouting report - and lists his expected arrival time in the majors as mid 2006. Be sure to follow through to the interview on RedSox Nation.net, which reveals a down to earth guy who has differentiated between throwing and pitching very early in his career. Let's hope that we are talking about this start in a few years time as the start of a successful career for Jon in B-town. Well Terry had fun with Sox Nation this evening - I can't believe I was the only Sox fan that declared the Manny era over when I heard that he had been scratched just before game time. In his post game comments, Terry revealed that he had decided to sit Manny for a few days - my read on it was that he will sit again tomorrow - to allow all sides to take some deep breaths and focus on the second half. I am hoping that this really does mean that Manny is going nowhere - there just seems no way that we can fill the hole he would leave in our offence with any of the players who have been mentioned in the various trade rumors. In tonight's game, David Ortiz matched his career high with 4 walks - if we do trade Manny, you can imagine that Big Pappi will get many, many opportunities to match that career high whoever is hitting in the hole behind them. Well I had thought I would hold off and use the 100 game review to talk about the moves the Sox made at the non-waiver deadline, but given the hectic 'pace' of rumors it seems to make sense to separate them out. The last 20 games saw the team go a less than overwhelming 9-11, interrupted by the American League retaining home-field advantage for the Sox in this year's World Series... The 20 games didn't see anything different from the last 80 - when the Sox get decent pitching, they are more than likely to win. On the season (including tonight's game), the Sox have held their opponents to 3 runs or less in 44 games - and have won a staggering 41 of those. Since the 80 game report, the Schilling as closer experiment has begun and the results have been ok, but not so good that we should be encouraging Curt to give up the proper day job permanently. It is difficult to know at this stage whether starting would exaggerate the problems that he is having - that is, 6 innings at a 1.5 WHIP with the resultant runs scored - or whether the fact that all we are seeing is one inning at a time is exaggerating the issue as hitters are forced into aggressiveness given the stage of the game? We are really toiling against the AL East... well no, we are really toiling against the Blue Jays (3-8 on the season, 7 games to go) and also against the Orioles (5-7 on the season, 6 to go). Looking ahead though, if we keep up the exact same pace (again this is including the effect of tonight's game), the Sox project to a 93-69 record - two caveats to that - it needs the Sox to maintain their 1.00 record against the Twins (unlikely) and to win 4 of 6 from the Royals, who they have yet to play (likely, unless the Royals appoint a new manager just before the series starting on Tuesday). Are 93 wins good enough to get to the play-offs? I guess the fence sitting answer is... it might be. If it is good enough to win the AL East then it will be good enough to make the play-offs, but I doubt it will be good enough for the wild card. I bought myself a 12 DVD set! You have to know what I am talking about right? My Red Sox ALCS / WS set arrived yesterday, and I watched DVD 4 and DVD 12 last night - sadly you still have to listen to Buck and McCarver, but it feels pretty sweet to watch any Sox - Yankee game and know that the outcome will leave you with a big, big smile on your face. As a general question for the world - do DVD's 1, 2 and 3 actually have any content on them? Will any Sox fan ever really watch any of those three discs? Could the set not have included the ALDS games instead? For the last couple of weeks, Manny's behavior on the field has been a little beyond Manny strange - the exaggerated flip, stare and stroll on HR's, the failure to put in even any effort running out pop ups (and one particularly spectacular effort at Fenway where on a line drive to the CF he was no more than a couple of steps outside the batter's box when the ball was caught), the now regular trips into the Monster between pitching changes - I had written these off in my mind as just Manny being particularly Manny. Does the news that Manny has submitted yet another trade request indicate that his heart really hasn't been in it for these last couple of weeks? In tonight's post game, David Ortiz questioned the wisdom of Sox fans booing Manny in his first at bat - but to be fair to Sox fans, the reception that he received was far more positive than he could rightfully have hoped for, with the cheers seeming to far outweigh the boos by the time the majority of the crowd had voiced their opinion. I understand Ortiz's point - Manny has produced at a stunning level for a number of years, but what the players need to realize is that Manny has just told us, again, that he doesn't want us - that some fans want to boo him for that seems fair to me. The latest news has the Sox in serious discussions with 2 AL teams, 2 NL teams and the now 'on-hold' 3 way trade with the Mets and Rays. The only thing that I would say to any of these reports is that Theo has typically operated under the radar in all his trade negotiations - and at this time of year, anyone that has held a baseball becomes "someone close to the negotiations" - I mean I am close to Omar Minaya if you really want to get down to it... about 25 miles from here to Shea has to count as close right? If Theo is seriously considering a trade for Manny which involves us giving up not only Manny, but Shoppach and Sanchez, to get back Mike Cameron and Aubrey Huff... then I really would begin to believe that perhaps a pact had been made with a certain horned man to deliver the World Series last year. Thankfully, given his track record, I really don't believe that Theo is considering that type of trade - he is on record as saying that unless we get $ for $ value, he simply wont make the trade - that trade may be $ for $ value, but we wouldn't be talking about US$ for US$ - what is the exchange rate on the Zimbabwe $ at the moment? The Sox still need pitching... and tonight's news that Miller was scratched due to stiffness in his pitching shoulder may only increase that need. In an ideal world, our lineup could do with an upgrade at 1B (I really do believe that Kevin Millar has completely lost his power stroke - how many 'big' hits have reached the warning track in the last ten days? ), an upgrade at 2B, and given Trot's status, possibly an upgrade at RF. In the real world though... pitching, pitching and pitching would be nice... and an upgrade at 1B - sorry Kevin! Well a week to go. The Sox have made a number of additions in the last ten days or so, with a couple of important additions by subtraction as well - both Jay Payton and Alan Embree going via the DFA route. Given that the Sox continue to scuttle along at a .500 clip - aside from those 2 weeks after Theo's 'is that really how well we can pitch' speech in Chicago, that is essentially what these Sox are (sound familiar?) - the feeling grows that the Sox will be adding to the roster from outside the Sox extended organization. Among the various sports news sites and blogs that I roam on a daily basis you can find the Sox linked with all of the following - JC Romero, AJ Burnett, Mike Lowell, Alfonso Soriano, Jason Schmidt, Eddie Guardado, Danys Baez, Billy Wagner, Tom Glavine, Mike Wise, Miguel Batista, Ricky Bottalico, Mike Sweeney and Adam Dunn - given these have all been mentioned, I wouldn't mind a reasonable wager that none of them are in red Sox this time next week. The Yankees behind a nice outing from Al Leiter took the series from the Sox last night in a good game in Fenway. Home Runs by Jorge and monster shots by Sheffield and A-Rod had the Yankees in a great position going into the ninth before the panic set in. After a lead off round tripper to Manny, Flash walked the next guy and in came Mo. The best closer in baseball got the double play grounder to second, only to see Robinson Cano throw it away into CF. Great. A hard hit RBI single and a bloop meant that the Sox had bases loaded nobody out and were just two behind. Alex Cora hit a sharp grounder to third, A-Rod came home and got the runner on the force, Jorge fired to first, double play! Yes, I know Cora was safe but so was Giambi in an earlier albeit less important spot. Damon would ground out and the Yanks would win. It was a massive win for the Yankees, behind the arm of Leiter, which did look impressive despite his struggles with the Marlins, the Yankees were able to grind out a win against Tim Wakefield, a guy they usually can't hit for toffee. The Bombers go into Texas and Anaheim on a high and if they can keep up this momentum of clutch hitter and showing some real drive then maybe, just maybe, this team may be playing ball come October. Did we play last night? The Sox beat up on the Yankees reserves last night cue a very happy Mr Hay. The fact that Tim Redding and Darrell May are New York Yankees is bad enough, the fact that they are allowed to play is tantamount to grand theft auto. I chose to sleep instead of watching the game last night as I knew it was a Red Sox victory, upon waking up and being confronted with a 17-1 scoreline, the first thing I did was to check Ortiz's numbers (as he's my fantasy 1B) and then saw Neil H had kept Trot Nixon rooted to the bench and missed out on his inside the park HR. Today Randy hooks up with Matt Clement in what, on paper, is the best matchup of the series. I shall be off into London to watch the game with the owner of the interesting new Spurious Baseball blog. Cue arguments about Roger Clemens. Al Leiter looks set to go on Sunday as the Yankees will trade for him today in exchange for a low level prospect PTBNL. Still it could've been worse, I could've stayed up to watch it! Well the night after losing a tough one, the Sox highlighted what is likely to be the Yankees achilles heel over the next however long that Redding and May are realistic pitching options. The Sox hit whichever Yankee pitcher was on the mound hard and often - Redding gave up 4 hits, 4 walks and 6 runs, May gave up 6 hits, 3 walks and 6 runs, Anderson allowed 2 hits, 2 walks and 4 runs, while Buddy Groom allowed 2 hits, 0 walks and was charged with a run - but that run was the last man across the plate on an Ortiz grand slam (incidentally, the Sox 9th of the season, tying the team record, with a heck of a lot of games to go). Last year I thought Torre misused QuanGorMo - bringing them into games that the Yankees had already put away, or in tighter games, when the Yankees already had a commanding divisional lead. This year, given how the Yankees performed in the first half, there will most likely be a lot of must win situations for the Yankees, meaning a lot of use for SturGorMo - with the same potential for late season cause / effect results that hurt the Yankees in the playoffs last year. Cashman insists that the Yankees will not look to trade chips for veteran talent, as the Yankees look to re-establish the model that was so successful in the mid and late 90's - a core of homegrown players complimented by trades and free agent signings. However, Wang's badly timed trip to the DL, rumored to be for the rest of the season, combined with continuing question marks over the health of Johnson, Pavano, Wright and Brown may mean that the need for genuine starting talent is now so urgent, that that goal needs to wait a while. Brown is scheduled to return to the Yankees next week, but I don't think it is just my Sox fandom shining through when I state that it has to be considered unlikely that he will make it through the rest of the season unscathed. To win at anything in life you need bottle. Last night the Yankees showed an awful lot of bottle as they came back from behind to beat the Red Sox in the first of four games at Fenway. 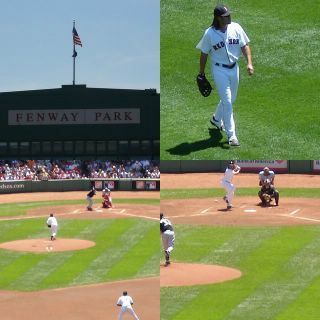 A two-run shot from A-Rod off Sox closer Curt Schilling opened the door and Mariano Rivera struck out the side including David Ortiz swinging for the final out. The Sox had stung the Moose for four runs before the Yankees came out for their second set of three outs but the Yanks would keep battling away. Giambi wrapped one around the Pesky Pole although Nixon had a shot at it but a fan got in the way. Bernie then hit a good curveball and tried to hit the guy on the head as it fell within six feet of him and Sheffield would also hit a lazer HR just to the right of Johnny Damon in CF. With Tim Redding going tonight the Yanks needed to keep a couple of fresh arms in the bp, and after a horrible 1st inning you worried but Moose battled through and Proctor and Franklin saw no action and could put together 3/4 innings tonight if needs be. Does A-Rod's dinger mean that stupid fans will stop saying that he isn't clutch? It was an important come from behind victory against the top team in the AL East and it was a legitimate hit and is atleast an RBI in any ballpark. With that Hampshire are 279/7 chasing 358 and need 80 off 70 balls, who has a clue what I'm going on about? Why did we bring in Schilling in that spot? Well we have reached the half way point represented by the All Star Game - always a good point to look back... and forward. Looking back to my pre-season review I think I need to make a strong, "well we are only half way through" defense - at least three out of six divisions have my prediction on top at this point. It may be something as simple as reliable arms in the bullpen, or a 1st baseman that isn't the offensive hole that is Kevin Millar, but I doubt it, it is something more to do with the spirit of the team. The comments in the last weeks from Keith Foulke and Johnny Damon, the outburst from Jay Payton that led to him being DFA'd, and a few other comments that have leaked into the Boston press are a symptom of a certain malaise, where players, fresh off a long dreamed for championship season, are unsure of the power they hold, and are not quite sure what to do with it. The comments by a few players suggest to me that there is a mentality at play that says, but we delivered the championship that you wanted... what more do we have to do...? Is Jason Giambi back to being a presence in the New York Yankee line-up? His series against the Orioles suggests so but my colleague Mr Hay was not convinced in any way that Giambi was having anything other than a short "hot streak and he's facing rubbish pitching". Well looking at his stats and there is a reason for genuine optimism. He hit .310 through the month of June and although his power wasn't there you felt it was coming. His three homers and two doubles in the short two-game home stand with Baltimore even saw him get a standing ovation when he was removed for a Pinch Runner. The home crowd have given him a bit of stick but the players have always been very supportive, noting the hard work he puts in day after day to get his stroke back with Donnie baseball. You can see the players are desperate for him to turn it around and as his stroke comes back so will his confidence. He won't need to cheat on a fastball and if his bat can speed up then he is a real force for power as well as OBP in the the middle of the Bronx Bombers batting order. Now I'm away for the long weekend and I bet he fails to get a hit after I've said all that! In the last 20 games, the Sox went 14-6 and took over first place in the AL East - I really doubt that I will have to say that they are looking up to the Orioles in the standings again this year, but I am not yet confident that the home team 9 will not be looking up to the Yankees at some point in the not too distant future. Part of the reason for that pessimism is the fact that the Sox started those 20 games 12-2, and (I hear your minds whirring) finished that stretch 2-4, with tough series losses to the Indians and Blue Jays, on the back of pretty poor pitching from the bullpen - 7, 12, 2, 15, 4, 5 and 6 aren't my lucky numbers, they are the number of runs the Sox have given up in the last 7 days - guess which two were wins? In my 60 game edition, Theo had just given his "if this is the best they can pitch" statement - and for 2 weeks, it looked as if his words had worked, but sadly it now looks as if those 2 weeks were the aberration, rather than the 10 weeks before that - did someone scream sample size? In the last week the Sox have started the internal audition phase of the bullpen changes - Matt Mantei has headed to the DL, Keith Foulke may be joining him, Abe Alvarez came up to have a quick look at the Fenway bullpen bench (he did warm up at one point - I saw him with my own two eyes) before heading back to Pawtucket, while Jeremi Gonzalez and Lenny DiNardo joined the pen for the current roadtrip - presumably the plan was that one of them would retreat to Pawtucket when Curt rejoined the rotation in Baltimore, but given his "frustrating" outing last night, this no longer seems a sure thing. In addition to these auditions, you would have to assume that Theo has also reached the conclusion that this team cannot hope to win it all with this bullpen, and that a very large part of his life at present is taken up with calls to other GM's to discuss who might be available at what price. The next of these reviews will be posted around the 27th of July - only 4 days to the trading deadline. I will be very surprised if the Sox bullpen does not have at least one or two completely new names by that time. Well the lucky hat finally lost - a strong 5-0 including a World Series victory came to an end at Fenway today, though it really shouldn't have - the Sox had many chances to win this one, both early and late. The real highlight of the day for me, was my first experience sitting on the Green Monster - Section 10, row 2 - probably considered the worst section on the Monster as it is closest to the bleachers, but it gives you an almost head on view of the plate, and the perspective of the game, the stadium, and the city of Boston is truly stunning. The photographs above, left to right and top to bottom, were taken from my seat - first off the classic facade of Fenway above the .406 Club, Johnny warming up in CF - and there is a worn patch on the field where he generally stands, first pitch of the game from Bronson Arroyo, and then first pitch of the bottom half from Halladay - to my credit (read luck) I actually managed to capture the pitches on their way to the plate - if you click on any of the photos you should get a larger image that reveals the ball! The Yankees designated for assignment P Paul Quantrill and P Mike Stanton today - and given that neither is likely to accept an assignment to AAA Columbus, they will likely be free men in 10 days time. While DFA may be three cruel words, MLB contracts are guaranteed, and they will receive their full salaries (plus any associated buyouts for 2006 and beyond) from the Yankees, unless (a) someone claims them in the 10 day period or (b) they sign on elsewhere after they have been released - at which point the Yankees are released from the pro rata remaining share of the MLB minimum salary, but must pay the balance. So for not turning up for work after July, these guys get a full year's pay... maybe those three words aren't so cruel! Together they represent $32.0M of salary - enough to help a Royals or Devil Rays almost double there payroll! If you add in Danny Neagle - who was released following an unfortunate meeting with the Denver police while he was otherwise engaged, who had $19.0M remaining on his contract, although I never saw the terms of his negotiated settlement - you are talking about teams spending $40.0M+ on players who no longer add a cent of value - a true example of addition by subtraction. Setting aside Charles Johnson, the common theme is pitching - teams appear increasingly willing to accept the fact that they make expensive mistakes with pitchers, and would rather eat the contract than continue to allow these guys to create further nightmares on the mound every fifth day, or sit unused, except in blowouts, in the bullpen.